Welcome to the Baboon Rising website. This page is compatible with all browsers in all tablets and phones. The new album "This Composition" is out now! 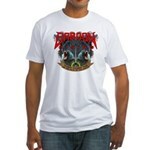 Baboon Rising is comprised of outlandish lyrics and set to the soundtrack of metal. Out of the ordinary best describes the lyrical content from political themes to subjects never broached before in metal, marinated with humor throughout. Check out this T-Shirt. You want one! Don't you? I can just sense it. The only problem is that they cost money. Sorry about that. I can't even get one free. The place where our coins are manufactured. I like coins. The best situation comedy in television history.